For the GameCube remake, see Sonic Adventure DX: Director's Cut. For the downloadable version, see Sonic Adventure (2010). For the Tiger LCD version, see Sonic Adventure (LCD game). 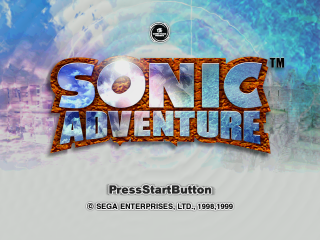 Sonic Adventure (Japanese: ソニックアドベンチャー) is the first Sonic the Hedgehog platformer released on the Sega Dreamcast, in turn being the first main title in the series done entirely in the still-new form of 3D gaming. The game marked a new era in the franchise, with a completely different feel and style than what was found in the 16-bit era. Originally referred to as Sonic RPG, the intent was to give a Sonic game a more "adventure" feel, with a greater emphasis on characters and story than was found in the classic Mega Drive titles. The game is not only notable for catapulting Sonic back into the mainstream (after a poor showing on the Sega Saturn) but also for adding quite a few elements into the Sonic franchise that were not present beforehand, such as the Chao Garden and its related minigame Chao Adventure, playable through the unique memory stick on the Dreamcast, the VMU. Completely redesigning the original cast and introducing new characters, the game tried to respect both the old and the new, at the same time proving the Sonic character to not just be an icon of the 16-bit age, but for numerous generations of gamers. A cryptic mural; an ancient tale; a foreboding prophecy. Over three thousand years ago, there was a wise and prosperous tribe known as the The Knuckles. Led by a woman who was part of the tribe's moderate party, she led her people as they lived in harmony with the mountains and jungles that housed other nearby people. Trying to teach her son the way she lived, the young boy Pachacamac grew with discontent, feeling that the tribe he was one day set to rule had a far greater destiny than the simple existence they had. Once he had come of age and became the leader of the tribe, he set his sights beyond the walls of the city, wanting nothing more than establishing his dominance on the planet, with The Knuckles not only ruling themselves but the many other tribes that lived nearby. His mother, against her son's intentions, stood in his way at every opportunity. However, it was only a matter of time before age would play a factor, the kind woman finally succumbing to mother nature and passing away. With the death of his mother, Pachacamac finally saw his opportunity, gathering together the tribesmen he saw had the greatest potential. Quickly he transformed them into a fighting force, and gathering his army the tribeleader began his assault on the neighboring countries. With each fight came victory, and soon every tribe and country was under his control, The Knuckles being a force no one could counter. Before the death of his mother, Pachacamac had fathered a daughter named Tikal, who immediately gravitated towards the old woman, captivated by her peaceful nature and soaking up the many stories she would tell. There was one story that would stick out in her mind, connected to a mysterious altar that lay outside the city's walls, an extremely holy place that no one dared to desecrate. This altar, with seven visible gemstones perched high atop seven equidistant pillars, guarded a secret that no one knew, as no one had ever dared to go up the steps to see inside. Treating it as holy ground, the people of the city often celebrated its power, placing it as the reason why they were prosperous, and after Tikal's grandmother died also attributed them to the reason why they were able to expand and conquer. A father and daughter at odds. Knowing that the seven emeralds at the altar held incredible power but not knowing much else, Pachacamac soon began to contemplate an action that was completely against the very nature of the tribe: to take hold of the Seven Emeralds and use them not only to secure the power he had already gained, but to expand his empire further, wanting nothing more than to rule the Earth. His daughter, distressed by her father's desire to conquer other people's holy ground, immediately took a stance against him, telling him time and again that he should stop his quest. Her words, however, fell on deaf ears each time. As her father began to prepare and seize the emeralds, Tikal decided to go to the holy place herself, approaching the altar and looking upon it. It was this moment where she first met the Chao, a race of water spirits that resided at the altar and the force that prevented Pachacamac from immediately storming the ground for the power he was seeking. Approaching the creatures carefully, Tikal comforted them, telling the beings they had nothing to fear from her. Only after being befriended by the Chao did Tikal look upon the face of the being that was the true guardian of the altar and the Chao that lived there - Chaos, a large transformed Chao, though at the time he was only known as the "Spirit of Water". Chaos confronted Tikal, examining her and making sure her intentions at the altar were pure of heart. Only then did the spirit permit the girl to walk up the steps that few had treaded upon. The interior of the Emerald Shrine, before the siege. At the center of the altar was the Master Emerald, the "controller" of the Seven Emeralds, and the key that explained to her the poem that her grandmother made her remember by heart: "The servers are the seven Chaos / Chaos is power, enriched by the heart / The Controller serves to unify the Chaos." Realizing not only that her father would be desecrating sacred ground, but also would try and harness a power he could not control, Tikal approached her father, trying desperately to dissuade him from going after the emeralds. Each time she spoke, her father returned only ignorance, the young girl instead asking Chaos if he could take the emeralds and the Chao with him and escape to a safer place, out of the hands of her father and the greed that was consuming him. With only the sound of water, Tikal realized that this was not an option, and that a stand between the two sides was inevitable. In one last, desperate bid to stop her father, Tikal stood at the foot of the altar, blocking Pachacamac and his warriors' path to the emeralds. Trying to reason with him, he ignored her one final time, telling his troops to charge ahead, attacking his own daughter in the process. Becoming unconscious, Tikal was not able to bare witness as her father ran upon stairs he was never meant to cross, seeing with his own eyes the Master Emerald and the creature that would be Chaos. Once she came to, Tikal could find no trace of her father or the warriors, the Emeralds that were once on the pillars missing. Running to the center, it was then she learned the terrible truth - that Chaos, in his attempt to stop Pachacamac and protect the Chao, used the power of the Emeralds to transform into something else entirely, a creature of vast and uncontrollable power that could destroy the world. Remembering the words of the poem, Tikal asked for the Master Emerald's help to stop Chaos before he wiped out every living thing in his rage. The first meeting between Knuckles and Chaos. Many millennia later, the mad genius Dr. Eggman, licking his wounds from yet another defeat at the hands of Sonic the Hedgehog, decided that the best place for his ultimate city - Eggmanland - to be built would be the current location of Station Square. Coming up with a plan to destroy the city so that his image can reign supreme, Eggman decided to build his base on the edge of a place called the Mystic Ruins, for even though it was but a train ride away from the bustling metropolis, it was still a place that held an abundance of secrets. It was only by chance that, while excavating the grounds to build his glowing headquarters, that Eggman came across a pair of stone tablets with an ancient inscription upon it. Hastily translating the words, the evil mastermind discovered the legend of Chaos, and its connection to Angel Island. With a laugh, he journeyed to the floating island in the dead of night aboard his latest creation, the Egg Carrier. The true face of Perfect Chaos. Meanwhile, Sonic the Hedgehog, once again looking for excitement and adventure, happened to jump right into the heart of Station Square, the next destination on his vacation plan. Excited to see the sights and sounds, the hedgehog stood atop a skyscraper, taking in the city's bright lights and breathtaking visuals. Suddenly, the sound of police sirens filled his ears, looking below seeing the cars the sirens belonged to. Heading off toward the direction of City Hall, Sonic jumped down to the road below, deciding to investigate, always looking to get into trouble. What he found was a police barricade, the officers trying to shoot down a mysterious water creature. Finding their weapons useless, the police retreated, giving Sonic the opportunity to engage the creature. With a smirk and the hope for fun, he jumped in fighting off Chaos 0 in an instant, the creature slipping away down a sewer drain afterwards. Standing in the rain, Sonic remained unaware of Dr. Eggman watching from a rooftop overhead, laughing at the hedgehog and his being unaware of the creature's potential for power. It would only be the next day when Sonic, along with Miles "Tails" Prower, found out the creature's name, his ability to use the emeralds, and Eggman's plan to turn Station Square into his own personal city. Now Sonic must not only try and gather the Chaos Emeralds once again and stop Dr. Eggman, but in the process run into old and new friends all while unknowingly uncovering the secret to the strange creature known only as Chaos. For Sonic the Hedgehog's first major title in 3D, and in an attempt to live up to the Adventure title, Sonic Adventure is split into two main parts: the level based "Action Stage" and the slowed down, explorable "Adventure Field," with each of the six playable characters having their own unique playstyle and goals. The original unveiling of Sonic the Hedgehog as depicted in Sonic Adventure. Being the title character in the game, Sonic the Hedgehog is given the largest focus, his story and number of playable levels being greater than any other cast member. Even in the third dimension, the basic goal of each of Sonic's levels remains familiar: to reach the end of a level while avoiding traps, pitfalls, and the occasional enemy badnik built by the nefarious Dr. Eggman. While the classic titles had a ten-minute time limit, the limit has been lifted to give the player more than enough time to get used to the modified control scheme. Thanks to the new plane of movement, pressing any direction of the control stick will send Sonic in that direction. Pressing up will move Sonic forward, pressing down will cause him to quickly turn around in the opposite direction, and pressing the traditional left or right directions will let Sonic explore either side of his world. Though sometimes it may seem confusing as to where Sonic is meant to go next in each level, the camera system in the game is built to help guide Sonic along a certain path, leaving enough room to divert into the occasional alternate pathway. For the first time, more than one button on the control pad can be used to make Sonic perform alternate moves during the course of the game. The jump button is still used to make Sonic curl up into a ball in the air and perform a spin attack where he can hit any enemy as long as they are not covered in spikes or some other projectile. Pressing the jump button twice allows a brand new move in Sonic's arsenal to appear, the homing attack. As the third dimension does not allow for as easy precision as a two-dimensonal plane would, the homing attack allows Sonic to "lock-on" to the nearest enemy or other interactable item and zoom ahead, curled up in a ball and subsequently attack it. This attack especially comes in handy when Sonic is forced to cross a pit of lava or one without a bottom and the only items between him and certain death are a row of enemies flying about. The secondary action button now gives Sonic the ability to curl up in his trademark spin dash, holding the button longer making Sonic charge up the dash more. From a standstill, tapping the button will allow Sonic to burst ahead with the slightest amount of speed. However, while running, barely tapping the button will cause Sonic to curl up into his spin just as in the classic games, allowing him to smash an enemy that may be in his path without having to jump. Sonic also has the ability to pick up items that are near him, such as keys necessary to get into other levels or Chao's during the Chao Garden portions of the game. Tapping the action button allows this move, though if not close enough to the item Sonic will default to the spin dash. Sonic's iconic run through Emerald Coast. This is also the first title that allows Sonic's moveset to expand as a player progresses through the game. Placed in the Adventure Field and accessible at certain points in the story, there are a total of three separate upgrades available to Sonic, though only two of them are mandatory. The first of these are the Light Speed Shoes, which look like a pair of Sonic's trademark shoes slightly altered. When acquired in the sewers of Station Square, Sonic now has the ability to dash through a string of rings if he charges up his spin dash. Once a glow is around Sonic, he can walk up to the string of rings and, letting go of the action button, will let Sonic use this Light Speed Dash to reach areas he normally couldn't. The second item necessary in the game is the Ancient Light, found on Angel Island. Looking just like a ball of light, when Sonic touches it he gains an ability similar to the Light Speed Dash. Called the Light Speed Attack, Sonic can now attack a string of enemies in one go after charging up his spin dash. The third upgrade item in the game is found in the Station Square hotel. Called the Crystal Ring, the item is only accessible once you have the Light Speed Shoes. The ring, which goes on Sonic's wrist, allows for a far shorter charge of the spin dash to enter either the Light Speed Dash or Light Speed Attack. In Sonic's run through the game, the character progresses through ten of the eleven levels available. In order, they are Emerald Coast, Windy Valley, Casinopolis, Ice Cap, Twinkle Park, Speed Highway, Red Mountain, Sky Deck, Lost World, and Final Egg. Scattered through each level are a multitude of items, many familiar to anyone who has played a Sonic game in the past. The most common item once again is the ring, which protects Sonic from losing a life as long as he has at least one in his possession. The dangerous bed of spikes also return, which should be avoided at all costs. The classic lampposts that mark Sonic's position in the level so he can restart there in the case of losing a life also return, but are now a pair the character runs through as opposed to a single post you run by. Springs that allow the player to reach higher platforms also appear. The Dash Panel, an item which was rarely seen in Sonic the Hedgehog 2 and Sonic the Hedgehog 3 also make a return, though in abundance, allowing Sonic to instantly gain speed when he runs over them. The item boxes also return with a vengeance, a total of nine possible power-ups available for Sonic. The classic shield returns, as well as a variation of the Thunder Barrier, called the Jiryoku Barrier, attracting rings and providing the protection a normal shield offers. Invincibility, Super Speed, and 1-ups also are available, as well as the ring boxes. However, instead of only offering the ten-ring box as in previous games, two new variants are offered: a 5-ring box, and a random ring box, which can be worth 1, 5, 10, 15, 20, or 40 rings. Also new to the arsenal is the explosion item box, which will instantly destroy any and all enemies that are on the screen at the time. As the Action Stages are not broken up into separate acts this time around, the signpost meant to signal the end of the level is replaced with the capsule that holds the various animals that pop out of badniks in the game. However, while the capsule is the standard greeting, there are times when other objectives are presented for Sonic to reach, such as a Chaos Emerald or Tails recovering from a plane crash. When these Action Stages are later replayed, the alternate goal is replaced with Dr. Eggman's capsule machine. The original unveiling of Miles "Tails" Prower as depicted in Sonic Adventure. Miles "Tails" Prower takes many of the same cues from Sonic the Hedgehog when it comes to controlling in the game Sonic Adventure. Using the control stick to run about in a three-dimensional game, pressing the jump button also lets Tails curl up into a ball and perform the vintage spin attack. 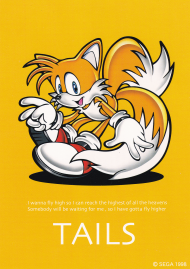 The flight ability for Tails also returns, once again initiated by pressing the jump button twice, allowing the two-tailed fox to rise above the ground for a short period of time, able to ascend the entire duration. However, instead of being able to replicate the spin dash and the other moves connected to Sonic, the action button offers an entire new move set for Tails. Pressing it allows Tails to do the Tail Rotation Attack, in which the fox uses his tails to swipe at enemies, breaking them apart, all the while twirling on the point of one of his feet. The ability to pick up objects is also present. Just like Sonic, Tails also has his own set of upgrades scattered throughout the course of the game which can modify his abilities. The required upgrade is the Rhythm Badge, found in the past version of the Mystic Ruins. The badge, which goes upon Tails' chest, gives him the ability to continuously engage in the rotation attack, now called the "Continuous Tail Rotation." The second upgrade available for the fox, the Jet Anklet, is found in Station Square. Attaching to his shoes, the anklet allows Tails to fly faster than before, allowing him to cover far more distance than he would normally be allowed to. During the course of his adventure, Tails only has access to five Action Stages: Windy Valley, Casinopolis, Ice Cap, Sky Deck and Speed Highway. While Sonic's version of these levels are broken up into two or three distinct parts, Tails' version of the levels are decidedly shorter, often only focusing on one part of the level. The reason for this is, instead of merely emulating the goal of getting to the end of the level, Tails' levels have an added racing element, in which the player must control Tails in a race against Sonic or, in the case of Speed Highway, Dr. Eggman. Only by reaching the end of the level first will allow Tails to win the race and, subsequently, the level. Though the capsule is once again used to signal the end of the stage, there are times when other items are used to alert the player where the finish line is, such as a Chaos Emerald or a missile lodged in a building. There are also times when Miles "Tails" Prower can be playable in Sonic the Hedgehog's story through the use of a second controller, much like he is controllable in Sonic the Hedgehog 2 and Sonic 3. However, because of the nature of the game, it is much harder to keep both characters on the screen at once. The original unveiling of Knuckles the Echidna as depicted in Sonic Adventure. Returning to the forefront, Knuckles the Echidna once again takes similar cues from Sonic the Hedgehog but deviates with his own unique abilities. Fully controllable in the three-dimensional game with the control stick, the jump button causes that familiar spin attack to be a part of Knuckles arsenal. Pressing the jump button twice will allow Knuckles to glide through the air, slowly descending along the way. Hitting a wall while gliding (or simply jumping into a wall and pressing jump twice) will let Knuckles climb up nearly any surface, allowing him to reach higher places that he wouldn't normally be able to. The action button gives Knuckles a new attack, hinted at in Sonic the Hedgehog 3 but not usable in that game: punching. The Punch Attack can either be done on its own with one push of the action button, a quick one-two jab with two presses, or a full triple combo with the third being a powerful charge with three presses of the action button. Also, just like the rest of the characters in the game, Knuckles has the ability to pick up items at will if close enough to them. The Guardian of Angel Island also has two upgrades available to him in the game, one of them being necessary, the other once again optional. The first of these, the Shovel Claw, is found in the Mystic Ruins and allows Knuckles to dig in dirt and grass. Pressing both the jump and action button at the same time, Knuckles will disappear into the ground, sometimes coming up with nothing, other times coming up with rings, a shield, or even invincibility or speed shoes. The second upgrade, the Fighting Gloves, is located in the jungle section of the Mystic Ruins. Being an optional addition to Knuckles' arsenal of moves, the yellow gloves provide the echidna with the Maximum Heat Knuckles Attack, the echidna's answer to the Light Speed Attack. By holding the action button, Kunckles can charge up and unleash himself at a group of enemies, defeating them all at once instead of one at a time. Though he shares similar moves with Sonic and Tails, Knuckles' game actually plays quite differenty from the duo. Instead of trying to reach the end of a level, Knuckles climbs, glides, and runs through each, exploring every nook and cranny seeking three shards of the shattered Master Emerald, in the hopes of collecting all the piecs and restoring it, and in turn having Angel Island once again join the heavens. In each of Knuckles five levels, the shards have numerous locations programmed in which they could be, each playthrough being different than the last. Luckily, Knuckles has two tools he can use to track down the shards. The first of these is a psudo-radar on the bottom of the screen, each shard represented. If Knuckles gets closer to one of the pieces of the Master Emerald, the icon will start to blink rapidly, a beep joining the intensity of the radar. When it begins to flash red wildly, it means that Knuckles is only inches away from his goal. The second tool at Knuckles' disposal are the various hint orbs floating in the level. By touching one of them, the orb will shoot forward towards the nearest shard, leading Knuckles to his ultimate prize. The pieces can be almost anywhere: inside badniks, underground, and even just sitting out in the open. Exploring Speed Highway, Casinopolis, Red Mountain, Lost World and the Sky Deck, the Guardian must find all fifteen pieces before he can once again rest at the sacred altar of the Master Emerald. The original unveiling of Amy Rose as depicted in Sonic Adventure. 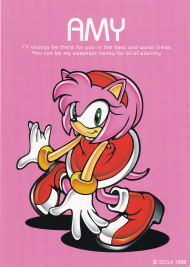 Though a hedgehog just like Sonic, Amy Rose's playstyle is similar in only the most basic of functions. Able to move about with the use of the control stick, Amy can traverse across the landscape with ease, albeit at a top speed far lower than the previous three characters. Though she can jump, she does not curl up, leaving her wide open to attack. However, Amy is not without her defenses, utilizing her Piko Piko Hammer if the need to fight arises. The basic attack with the hammer is called, simply enough, the Hammer Attack. Swinging her hammer to the ground, it also causes a small shockwave that can harm enemies if Amy is unable to make direct contact. She can also swing her hammer while in the air, initiating the Jump Attack, letting her hit any airborne assailants. As Amy's jumping height is not as proficient as Sonic's, she can also use her hammer to launch herself in the air. Called the Hammer Jump, the extra height allows Amy to reach areas she can not normally get to, the Jump Attack also available as she sores through the air for those brief moments in time. Two possible upgrades are available to Amy Rose, though once again only one of these is necessary to progress through the game. Found aboard the Egg Carrier, the Warrior Feather lets Amy use her Piko Piko Hammer to spin in a tight circle, holding it out and destroying any enemies that may be charging at her, possible only by holding down the action button and spinning the control stick in a circular motion. However, the Spin Hammer Attack is only temporary. If used too long, Amy will become dizzy, the player unable to control her correctly and leaving her open for any attack. The optional upgrade for Amy comes in the form of the Long Hammer, which gives the young girl's attacks a much greater radius. Found in the same spot on the Egg Carrier, it can only be unlocked after Eggman's floating masterpiece crashes into the ocean. Amy's story in the game starts in the middle of Sonic's, in which the young pink hedgehog strolls about the streets of Station Square on her own, shopping bags in hand and deep in thought. Recalling the time Sonic saved her from the clutches of Metal Sonic during the events of Sonic the Hedgehog CD, her train of thought is broken by a large shadow covering the city. Looking up into the sky, Amy sees the image of the Egg Carrier, immediately recognizing it as the handiwork of Dr. Eggman. Before she can even contemplate the idea of Sonic rushing into her life, a small Flicky comes crashing into her, having escaped from the ship. Dubbing the bird Birdie, she sets it upon herself to guard the bird once she realizes its being chased by ZERO, one of Dr. Eggman's robots. Playing through only three levels - Twinkle Park, Hot Shelter and Final Egg - Amy must try and reach the balloon goal all the while avoiding the attacks of ZERO and his attempts at capturing not only the bird, but her as well. Though Amy can attack ZERO with her hammer, she can not defeat him in any action stage, eventually the robot becoming immune to her defenses. As Amy plays as a much slower character, her levels also have a few more puzzle elements than the principle three, made all the more complicated by the robot pursuing her. Her ability to carry items also comes in handy when, at certain places, she can lift and hide inside a barrel when in a room with ZERO, the robot unable to find her while she hides. The original unveiling of Big the Cat as depicted in Sonic Adventure. The slowest character of the bunch, Big the Cat is something of an enigma when compared to the rest of the characters in the game. Though he is still fully controllable in the three-dimensional world of Sonic Adventure through use of the control stick, his playstyle is completely different. Lumbering about, Big the Cat does have the ability to jump when the corresponding button is pressed, but like Amy Rose is unable to curl up and defend himself while he does this, leaving himself completely open to attack. His only method of defending himself is by the use of his fishing poll that he caries about with him at all times, the action button letting Big swing the pole as if he were to cast it, being able to smack any nearby enemies. However, Big's game has little focus on any actual fighting, and instead is focused on fishing. Having lived in the Mystic Ruins for years, Big is at the wrong place at the wrong time on the night Dr. Eggman frees Chaos from the Master Emerald. Due to a small hiccup during the freeing process, Chaos' tail manages to separate from the rest of the water god, falling freely into the jungle below. Froggy, Big the Cat's best friend, happens to accidentally stumble upon the tail, which possess the frog. When Big wakes up and sees his friend now has a tail, the large cat is unable to stop the frog from eating his "lucky charm," the yellow Chaos Emerald. Determined to find his friend and snap some sense back into him, Big pulls out his trusty fishing rod and journeys to Twinkle Park, Ice Cap, Emerald Coast and Hot Shelter to reclaim his friend. By pressing and holding the action button, Big prepares to launch himself into fishing mode, a marker appearing showing where the line will be cast. By letting go of the button, Big casts his fishing rod, the line landing in a body of water if that is indeed where the marker was set. From here, the player can shake the lure about with the control stick in the hopes of attracting Froggy or, if that doesn't happen, one of the many other fish that are swimming about. Once caught on the line, pressing either the jump or the action button will cause Big to roll up the line, bringing the caught object closer to the purple cat. In his quest to fish for his friend, a variety of upgrades are available for the feline, many of them optional if all the player wishes to do is complete the story and move on. The one necessary upgrade, the Life Belt, is found on Angel Island near the entrance to the Ice Cap. Giving Big the ability to float in water, it allows the player to get up and close and personal with whatever they're seeking out to fish for, holding the jump button allowing Big to dive under the water. The first of the optional upgrades is the Power Rod, an alternate fishing rod that allows Big to cast a longer line, found in the Mystic Ruins where Big begins his journey. In addition, there are four optional lure upgrades scattered about the game, and while they are not necessary for the completion of the story, they are needed if Big wants to catch bigger fish. With one hidden in each Adventure Field, it is also the only upgrade in the game hidden inside one of the action stages, the Ice Cap. The original unveiling of E-102 Gamma as depicted in Sonic Adventure. Yet another character with an alternate playstyle when compared to Sonic, Tails, and Knuckles, E-102 Gamma is also the first playable character built by Dr. Eggman. Still controlled in the same fashion as the other characters with the use of the control stick, the jump button also performs the same action as the other five characters preceding. Just like Amy and Big, however, the jump move leaves the robot open to attack. 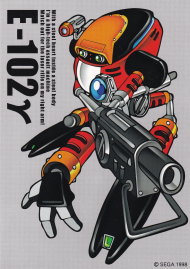 Introducing yet another new playstyle to the Sonic universe, E-102 is the first playable character to use projectiles as a means of defense. By pressing and holding the action button, a laser mounted to the robot's head will act as a tracking device, locking on to any nearby enemies. When let go, E-102 will subsequently shoot everything in his path. Shooting is not just so E-102 Gamma can engage in fighting off his objective, but is essential for the player to continue using him. Gamma is the only character in the game that is restricted by a time limit, a preset timer placed in the corner continuously counting down. If the timer reaches zero, the level ends and the player forfeits a life. Only by shooting enemies will the timer increase. locking on to more targets at one time resulting in a higher amount of time for the player. Since the targeting system will only last so long before it fades out, figuring out how many enemies to lock on at once in a given situation adds to the challenge of the game. E-102 also has two modes of operation: the standard walking animation and, if running forward long enough, a wheeled mode that allows Gamma to roll on the ground much faster than his legs will carry him. Eggman's robotic creation also can float on water, a propeller system emerging that prevents him from falling in when in this mode. However, this only works near bodies of water the cast can interact with, so Gamma will still fall into such places as the water in Windy Valley. In almost predictable fashion, E-102 Gamma has two upgrades available to him, only one being necessary to continue in the game. The required upgrade, called the Jet Booster, is found in the Egg Carrier and gives the ability for Gamma to glide. Though not as proficient as Knuckles the Echidna's gliding, it still allows Gamma to slowly descend from a higher location, giving him time to target enemies that may otherwise fly past him, as well as letting him cross pits he might not otherwise be able to. The second upgrade available is also located within the Egg Carrier, but is only accessible to E-102 when the ship is not in its Sky Deck mode. Called the Laser Blaster, it provides Gamma with a larger attack radius so he can lock on to more enemies at once, allowing his time to go up higher if done successfully. Though he goes through Final Egg, Emerald Coast, Windy Valley, Red Mountain and Hot Shelter, the objectives for the character shift in the middle of his game. Having been created by Dr. Eggman, the robots first moments of consciousness are inside the mad genius' base, seeing the face of his creator. Sent into the training ground of Final Egg, Gamma wants nothing more than to please his creator, being the second in the E-100 series. Thinking nothing of it, he immediately fights with his predecessor, E-101 Beta simply because Eggman asks him to, not thinking beyond what his orders are. It is only after the robot encounters Amy Rose that he begins to question his own programming, and for the final three levels in his adventure he turns against Dr. Eggman, resolving to free the animals trapped within the other members of the E-100 series and declaring Eggman his enemy. Big the Cat wandering about the Egg Carrier. While previous Sonic games had each level play one after the other, Sonic Adventure introduces a hub world system into the game. Dubbed "Adventure Fields," it is these areas that string together the events within the game, and serve as the doorwasys to each Action Stage. There are three main fields, each having a different theme. The first, Station Square, serves as the starting point for many of the characters, being the central hub to the city Eggman desires. The second, the Mystic Ruins, encompasses not only the area that contains Tails' Workshop, but a jungle area filled with ruins, accessible through a minecart. The fallen Angel Island is also part of the area, having once been part of the landmass thousands of years before the events of the game. The third field is Eggman's latest floating creation, the Egg Carrier, his home base as he plots Station Square's destruction and the rise of Chaos. There is also a fourth Adventure Field which is only accessible at specific times for each character. In each story, there is a moment when the character is given a vision of the past, the field being the Mystic Ruins before it turned into the ruined jungle, the ancestors of Knuckles the Echidna still a proud and much alive race. While the central purpose of the main three are to get from one level to another, they also serve as the perfect way to become accustomed to using Sonic and his friends in the third dimension. Knowing that a hub world is anything but linear, scattered throughout the three are various hint orbs that, when touched, will give the player a hint as to where they are meant to go next. There are times when an action level can not be reached until some sort of objective is met in the Adventure Field, be it finding a key to a door or locating an upgrade that will overcome an obstacle blocking the stage's entrance. The fields also serve as the backdrop to many of the various cutscenes and boss encounters in the game. Also of note is that, with the exception of the Egg Carrier, each Adventure Field is filled with a collection of Non-Playable Characters that Sonic and his friends can go up and talk to by pressing the action button. While sometimes they will also give a hint as to where the player should go next, more often than not they talk about something completely unrelated, recounting their own personal drama, such as the woman afraid to talk to the man she likes at the burger shop, the little girl waiting near the train station to see her father come home, or the boy who laments his mothers' gambling addiction. Though not vital to the story, they serve as amusing asides that make the world of Sonic the Hedgehog seem alive, alluding to the fact that it is not just a world made up of one hedgehog and one human in a constant battle. Amy Rose in her boss fight with ZERO. Instead of having Dr. Eggman encounter the player at the end of each level, the boss encounters in Sonic Adventure only happen at specific times, more often than not taking place somewhere on the Adventure Fields of the game. While each character has at least one boss battle, Sonic and Tails are the only two that fight with the doctor himself, both fighting his Egg Hornet early on and then the two getting their own personal final battle with him at the end of their respective adventures. The rest of the boss fights in the game are either robots built by Eggman's hand, or for the first time in a main Sonic title, a being that was not created by the doctor. Sonic, Tails, Knuckles and Big each have at least one fight with the water god Chaos, the principle three all going up against his Chaos 4 form. Though the same character, each encounter with Chaos offers its own unique challenges and attack patterns, much as each encounter with Eggman over the years has done the same. E-102 Gamma is the only character in the game to have a boss battle actually occur in the final moments of a stage, having to fight E-103 δ, E-104 ε and E-105 ζ in his last three levels. Sonic and Tails aboard the Tornado. In addition to the regular Action Stages and the Adventure Fields, there are also a number of Sub Games that occur during Sonic Adventure, most of them in one of the character's story in some form or another. Each of these Sub Games control completely different than from the normal areas of the game, offering up yet another layer of variety. The most prominent of these are Sky Chase Act 1 and Act 2, in which Sonic and Tails ride on either the Tornado or the Tornado 2 and attempt an air assault against Dr. Eggman's Egg Carrier. With the jump button turning into a gun and the action button becoming a way to lock on and shoot missiles as enemies, the two levels closely resemble a shooter in the vein of Panzer Dragoon. In Tails' Adventure mode, the young fox has an exclusive mini-game entitled Sand Hill, which is similar to the snowboarding sections of Ice Cap but is instead done on various sand dunes. Amy Rose also has her own sub game, Hedgehog Hammer. Done inside the Egg Carrier, Amy must use her hammer to smash apart the blue and yellow Sonic the Hedgehogs while avoiding the Eggman targets, the game being the source of her upgrades (as long as it is done within the Adventure Field). There is also a Twinkle Circuit available to every character once their adventure is completed, even if they are unable to play through Twinkle Park normally. The race behaves much as the first segment of Sonic's version of Twinkle Park does, except instead of one long stretch of road, it is a traditional three lap race, although it is only a single player mode. Super Sonic confronting the final form of Chaos. While the Chaos Emeralds are featured in the game, unlike previous titles they are not unlocked in a separate Special Stage. Instead, they are an essential part of the storyline, being found by Sonic and Tails at the end of action stages or by other means in an attempt to prevent Dr. Eggman from bringing Chaos to full power. However, the powered up transformation of Sonic, Super Sonic, is still accessible in the game, only in a limited capacity. Once all six characters have been played through and their stories completed, a seventh character will appear on the character select screen. Marked "Super Sonic," only a question mark greets the player as to what is in store. This extra storymode is actually the true ending to the game, answering questions that have been cropping up in the cutscenes of the six playable characters, showing the betrayal of Chaos and what truly happened 3000 years previous. Knowing time is short, Sonic and Tails (after Sonic experiences a lengthy flashback sequence detailing the final moments of Tikal and Chaos at the emerald altar) try to recover the seventh emerald before Chaos can, but are unable to. Now fully powered, Perfect Chaos attacks Station Square, in a sense accomplishing what Eggman wanted but with unwanted side effects. Discovering the hint orbs that populated each stage were really Tikal guiding the players, Sonic has no choice but to transform into Super Sonic and finally put an end to the threat that was birthed all those millennia ago. The character controls much like Sonic, just with a higher top speed, invincibility and the ability to run over water. Just like previous encounters with Super Sonic, the player must collect rings or else forfeit the transformation. If during the battle Super Sonic returns to his blue self, the player will lose a life, unable to collect fifty rings and turn back into Super Sonic. E-102 Gamma facing off against E-103 δ. The trial option on the main option screen to Sonic Adventure is similar to the Time Attack mode of Sonic the Hedgehog CD, giving players the ability to play through any previously completed stage at their leisure. Recording time, score, and number of rings, the mode provides numerous ways for a player to try and best themselves. It also keeps track of the number of challenges for each Action Stage that has been met with each character. Each level in the game has three separate tasks that must be finished with each character, the next becoming the target once the first is done. This is also true with the Sub Games for each character, although that only has one secondary challenge. The Sub Games that are available for each character are also expanded, with the ability to play through each boss for a character straight through, and certain segments that are part of a standard Action Stage are available for standalone playthrough, such as the snowboarding segments in Ice Cap. Sonic is also given the chance to play through Sand Hill, an area he is not allowed to enter in the standard game. Brand new to the Sonic series, the Chao are an additional mini-game that can be played outside of the regular levels. An extension of the A-life used in the game NiGHTS Into Dreams, the Chao Garden can almost be considered a full game on its own. Each main Adventure Field has an entrance to its own Chao Garden, with two unhatched Chao eggs. Picking them up and rocking them with the control stick will cause the egg to hatch, which then can let the player raise the Chao at their leisure. The Chao, which need to be fed, petted, and taken care of, also can use the abilities of the various animals that Sonic and company find in the regular Action Stages that pop out of the Eggman robots. Entering the garden, the collected animals will spring out of the playable character, and can subsequently be picked up. Walking over to a Chao with an animal in hand will cause the Chao to absorb the stats of the animal, also changing shape slightly. A variety of combinations can be achieved this way, and the many Chao one can raise can also be used in the Chao Racing section, located only in the Station Square Chao Garden. The Chao raised can also be used in the VMU-exclusive minigame Chao Adventure, which allows a player to raise their Chao on the go. To encourage replayability and exploration, 130 Emblems are unlockable through the course of the game, won by accomplishing a variety of tasks. Each time an Action Stage, Sub Game or Boss is completed, an emblem is awarded to the player. Each Action Stage has three emblems connected to each character, the Sub Games only having two. Emblems are also awarded after beating the seven story modes, and for winning the five Chao Races in the Chao portions of the game. In addition, each Adventure field holds four emblems hidden somewhere on the map, sometimes in plain sight and other times cleverly placed. Though nothing more than bragging rights in the original game, the Nintendo GameCube port of the game, Sonic Adventure DX: Director's Cut, gives an award if all are collected: a playable Metal Sonic in Trial Mode. Wanting to stand out from the original games and bring Sonic into the new age of gaming in a big way, Sonic Adventure decided to take the visual style in a whole new direction. While maintaining hints of the surreal, almost CG-esque visuals of the classic series, the developers wanted to make Sonic's world far more realistic than it had ever been, basing such levels as Emerald Coast and Lost World on real locations, sometimes even using photographs the team had taken in the textures. The characters themselves were all redesigned by Yuji Uekawa, given a more streamlined style meant to appeal to what was considered "hip" for the moment, especially in Japanese culture. The stark differences between the art for the original games and Sonic Adventure was one of its selling points at the time, delivering an experience unmatched on the Dreamcast. For the relaunching of the Sonic franchise, Sega gathered a huge team of musicians, some of which had experience making Sonic music in the past. Wanting to focus on a variety of musical styles instead of just one, live instruments were used throughout to take advantage of the space provided by the GD-ROM discs the Dreamcast used. One of the main musicians, Jun Senoue, reused a handful of songs he had written for Sonic 3D: Flickies' Island, a welcome nod to fans of the series that had purchased earlier titles. Vocal themes were also used in abundance, each playable character having their own specific song that reflected their character and style. Sonic's theme "It Doesn't Matter," for instance, was meant to be pure rock and roll, while Knuckles' "Unknown From M.E." was a much mellower, R&B driven song. Most of these themes were put together by Jun Senoue's band (later to be called Crush 40), linked together by the main theme of the game, "Open Your Heart." Egg Carrier computer Lani Minella ??? Off-screen citizen Lani Minella ??? Except for the initial Japanese 1998 release which was fully and only in Japanese, all regional versions of the game feature options to switch the voice language into Japanese and English and the text language into Japanese, English, German, French and Spanish. Game saves can keep track of game progress for up to three game saves per VMU. In addition there are several downloadable challenges and features that were previously obtained from the Sonic Adventure website. The website also allowed to upload scores and download character voice over themes. Sonic Adventure was originally released in Japan on December 23rd, 1998, a full nine months before the game appeared on western shores. In those nine months Sonic Team USA focused on tweaking some of the bigger bugs in the programming. Numerous glitches were fixed, as well as subtle alterations in design, including the removal of a neon-glowing cowgirl inside Casinopolis and the ability for characters to stand on top of the "Burger Man" statue. 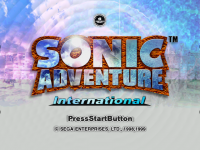 Also adding a more robust Internet offering, the western release of the game was subsequently offered in Japan under the name Sonic Adventure International. The game was later ported over to the GameCube under the title Sonic Adventure DX: Director's Cut, with remodeled characters, as well as the addition of a Mission Mode. A "Sonic Mini Collection" is also available, the 12 Game Gear titles that featured the cast of the Sonic games becoming unlockable as more emblems and missions are found and completed. However, many of the game's bugs that were in the previous builds remained, with a handful of new ones that occurred during the porting process. Though attempts were made to have the game run at 60-frames-per-second (a hope Sonic Team was unable to go through with the original game), problems arise at certain points, causing the frame rate to drop even below how it runs on the Dreamcast original. This version received a number of subsequent ports, with the aforementioned framerate issues corrected. The cover to Sonic Super Special 13. Having such a large emphasis on story, as well as being Sonic's triumphant return to the gaming world, both Archie Comics and Fleetway geared up to adapt the game in their respective printed universes. 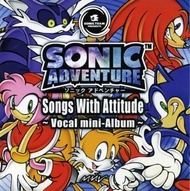 Originally meant to be in the three Archie titles printed at the time, the unexpected cancellation of the Knuckles the Echidna solo series caused the adaptations' plans to change, the content meant for those two issues being rushed into an extra issue of the main Sonic the Hedgehog series. The adaptation was published in issues 79 through 84, along with a 48-page special, the 13th issue of the Sonic Super Special series. The seven issue arc attempts to use the elements of the game in the Saturday morning-based world, offering explanations not only for Amy Rose's change in character design, but also how Station Square and human beings can live in the comic's world. The Fleetway series Sonic the Comic adapted the game over the course of ten issues, starting with 175 and culminating with issue 184. Instead of trying to force the game to fit in the comic's continuity, the game was liberally adapted, the Chaos creature's origins shifting from being a water god to being a rogue member of the Drakon Empire corrupted by the power of the Chaos Emeralds. Although featuring the return of writer Nigel Kitching, the storyline would prove to be the comic's last, the comic going into full reprint mode afterwards. Years later, the game would be adapted in the animated series Sonic X, becoming the first game adapted in the show's storyline. Beginning with episode 27, "The Beginning of the Disaster," and finishing in the 32nd episode entitled "The Scream of Perfect Chaos," the six-part epic attempted to cover the game as closely as possible, though some changes were made to coincide with the show's established plot, including the use of Cream the Rabbit and the show-exclusive character Chris Thorndyke. Also, the bird that Amy Rose protects in the game is given a name in the show, Lily. 2,500,000 (as of 2006) Sega Dreamcast Worldwide Gamatsura - A Detailed Cross-Examination of Yesterday and Today's Best-Selling Platform Games This sales data number makes Sonic Adventure the best-selling game for the Sega Dreamcast console. In the original Dreamcast version, the real-time cutscene playing just before Sonic's first level renders up to 50,000 polygons per scene. This was significantly higher than the polygon counts of any non-Dreamcast console and PC games released from 1998 to 1999. In comparison, the highest polygon count of any PC game released in 1999 was 10,000 polygons per scene.